Make time stand still in an elegant, dreamy place. Stumps Party dance decorations create an environment in which the moment means everything with the Forever in Time complete theme decorating kit. This elegant dance decorations kit comes with one luminescent circle arch, two luminescent balustrades, one enchanting illustrated window set and two modern luminescent columns. The following prom tips suggest ways in which the kit can be broken up and embellished to create an unforgettable time theme experience. Get the word out with the use of invitations and banners. Extend an invitation with the heavenly night book mark invitation. This 3 ½” by 7 ½” tasseled bookmark comes with 12 lines of customized text imprinted with black, silver or gold foil. This invitation also doubles as a souvenir of an unforgetable evening. Continue generating enthusiasm for the gala event with a large customizable banner. The moonlight clock personalize banner matches the theme perfectly and gives a sneak peek into the elegance that awaits. Welcome everyone with a sensational entrance. Place the kit’s two luminescent ballustrades to either side of the entrance. Cover the ballustrades in black soft stretch fabric and then wrap the ballustrades in silver cracked ice streamers to add sparkle. Add interest and accent coloring with bunches of ballons. For this color theme of black, white, silver and pink create multiple bouquets of latex balloons of these colors found in Stumps Party’s great selection of event supplies. Add a glow to the balloons by inserting radiant LED balloon lights into some of the balloons. Give depth to the entrance decor by hanging black gossamer and silver cracked ice streamers from the metal gossamer hanger with lights. Create the backdrop for your kit pieces by hanging more black gossamer across the wall breaking it up with panels of silver iridescent chiffon and pink tulle netting bound with cracked ice streamers. Add twinkle string lights to make it shine. Hang black and white 24″oriental stretch lanterns mixed with silver 36″ oriental elegance lanterns from the ceiling to create the romantic canopy under which everyone will be dancing. Cover the dance floor area with black flat paper to serve as the base for the decorations. Set up the kit’s luminescent circle arch wrapped in black soft stretch fabric embellished with twinkle lights and silver cracked ice streamers. Surround the arch with the kit’s set of enchanting illustrated windows. Choose the enchanting starry pink background illustration as the view seen out the windows. Next, set off one of the windows by placing the kit’s two modern luminescent columns on either side. Repeat elements of the look of the arch by covering the columns in black soft stretch fabric accented with twinkle lights. Give the floor a sense of airiness by scattering more black, white, silver and pink balloons around. Bring main elements of the dance floor into the picture area. Set up a modern luminescent column with balloon bouquets and balloons on the floor. Use the same dance floor background fabrics to accentuate the photo props. Create a fun and elegant area for snacking and conversation. Start with the table. Use the same pink tulle from the backdrop to cover the entirety of the table. Use strips of the silver cracked ice streamer to wrap around the edge of the table to add drama and to secure the tulle. Top the tables with the forever in time centerpiece and sparkle powder decorating accessory in silver. Stumps Party also has all of the event tableware that you’ll need. For a prom favor, wrap the napkins in the loop of the time stands still key tag. This favor serves to decorate the table and to provide something for each person to take home as a keepsake. The Forever in Time kit gives you lots of color choice flexibility for the easy creation of the perfect time theme event. Prom is a special time and for many students it’s the last big time together before graduation night. So, time is naturally a classic prom theme. 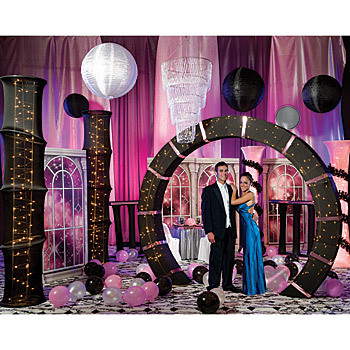 As Time Goes By is a new theme for 2008 that captures the timelessness of prom with columns, arches, and other elegant accents. Your As Time Goes By themed prom will be planned in no time with these tips! To capture the whole look, use the As Time Goes By Decoration Kit. The kit includes an As Time Goes By Arch which stands over 11’ tall. Accent it with an As Time Goes By Clock. Also included are two small As Time Goes By Arches, over 10’ tall, a 2008 wire column and a prom wire column, each accented with twinkle lights and three cardboard silhouettes of dancing couples. The freestanding couples create a lovely throw-back to proms gone-by. Accent your As Time Goes By kit with Modern Luminescent Columns. They’re made of beautiful white fabric and backlit with twinkle lights for a chic look that’s reminiscent of a diploma! Another great accent is the Time Goes by Clock. Place these clocks around the room, add them to columns, arches, around the dance floor and more! They emphasize the theme and look lovely! Create a beautiful backdrop for your theme decorations using metallic royal blue jewel tone gossamer, metallic silver gossamer or star patterned gossamer. Drape gossamer from the ceiling in wide swooshes to the floor. It also looks good in “puddles” lining the dance floor or photo area. Check out our gossamer tips for more ideas! Table decorations for this theme should be have a simple, classy design. You don’t need anything extravagant or complicated. We suggest covering your tables in black and/or white tablecovers and edging the table in black festooning. Scatter some silver star confetti over the surface and add the Timeless Clock Centerpiece to the top. Some simple votive candles make a nice touch. You can even customize them with your prom slogan and logo! Add black, silver or white tableware and you have a simply elegant and timeless looking table. Time may go by, but a picture can last forever. Prom pictures are a time-honored tradition, especially for mothers. Having a beautiful photo setting can make a big difference in how photos from your prom look in general. We suggest the clock face Time Stands Still Cut-Outs attached to a lighted wire arch or a set of giant silver numerals with the prom year. These photo settings and props will make your prom photos more special than the average snap-shot. Memory booklets are another way to keep your treasured moments fresh in mind. Try the Prom Confetti Booklet for this theme. The black booklet is imprinted with your prom details on the cover and has your custom wording on the inside. Then, the booklet is slid into a clear cover filled with prom confetti and held together with a silver cord and tassel. Check out our Booklet Ideas for how to fill and design your memory booklet! Clocks are natural favor for an As Time Goes By themed prom. There’s a huge selection of clocks, photo clocks and alarm clocks that can be personalized with your prom details or slogan and a logo. These favors are both functional and beautiful. Students will use them and remember prom for years to come. Another great favor idea is a photo box, album or picture frame. These favors can also be personalized with your prom details. Let us know about your time theme. We’d love to hear from you or answer your questions!